I’m doing okay. Been walking with the dog. Haven’t stuck to my podcast and book plan. Haven’t really counted my calories…and if we are being honest, I ate the chicken nuggets my kid didn’t finish tonight. I can’t leave a chicken nugget on the table…ever. I also can’t resist ordering fries, but that’s a story for a different time. I have, however, been more intentional and I’m writing this post now, so that is worth celebrating. 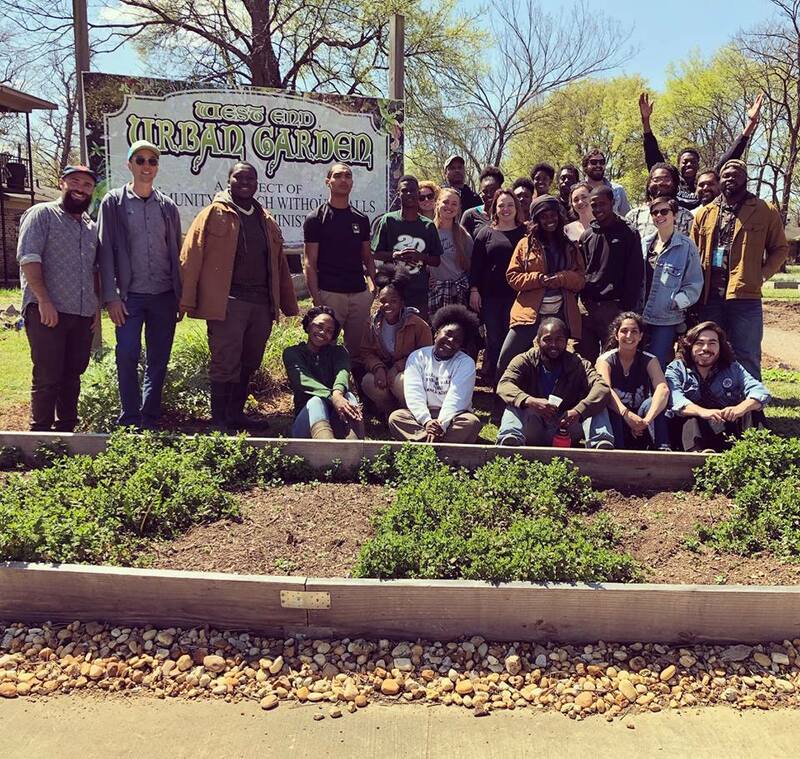 When I first started Food Revival, it was all about documenting the CSA box I got each week from Jones Valley Teaching Farm (then Jones Valley Urban Farm). This was NINE years ago. I volunteered my time at the farm and I got a box of produce in exchange for my efforts. Little did I know that this blog would be a platform to highlight the vegetables I got each week. I called it the CSA Challenge. Nine years and two kids later, I’m the Executive Director of Jones Valley Teaching Farm and I’m barely finding the time to pick up the veggies much less cook them. Thanks to Jesse that changed this week. Look at this broccolini. It is delicious and yes, you can eat the flowers. I followed THIS Barefoot Contessa recipe and even though the recipe worked perfectly, the broccolini was truly the star. And look at this Romanesco. What is Romanesco? (I asked the same question.) It’s a member of the cruciferous family (think broccoli, cabbage, kale), but it is MOST like cauliflower. I simply cut its florets off and sprayed with a little olive oil, sprinkled some salt and pepper over it, and roasted on a sheet pan for 20 or so minutes. Then I seasoned it with some chili lime seasoning I got at Trader Joe’s. Speaking of cauliflower, look at these beauties I got from the farm! I roasted them whole. I used olive oil and butter as the base and on one I sprinkled with cumin and the other with the chili lime seasoning I mentioned earlier. I think I’ll try a garlic Parmesan recipe next (like this one). So, no I haven’t found the perfect balance. I have, however, found SOME balance and if you remember what I said when I first started this new year, that’s just fine. Some is better than none. As I close this post I want to say THANK YOU to Jesse for reminding me to get my favorite veggies on the planet. I want to say THANK YOU to the farmers I work with because they grow the best food. I also want to celebrate the fact that I’m still connected to Jones Valley Teaching Farm and that FoodRevival still exists. This journey has been wonderful and hard and all the things in between and beyond. P.S. We also did a fun family taste test between store-bought carrots and the carrots I picked up from the farm. You’ll never guess the winner (unless you’ve had JVTF’s carrots because then you already know). I rang in 2018 with a quick run to my 2-year-old’s room at 1 am. She was crying, which is not like her at all. I scooped her up to take her to the living room to rock her and halfway there all I remember her saying is “my mouth” right before she threw up all over me. The next thing I know, Mike and I are navigating cleanup. I won Mae. He won the floor. This was the universe’s way of showing me that I won’t be able to control every aspect of 2018 and so I remain hopeful that I will keep the resolutions I made while staying open to all that 2018 clearly has in store for me. Oh, and Mae is fine. She’s had an ear infection for a few days and I think it pushed her right over the edge last night. 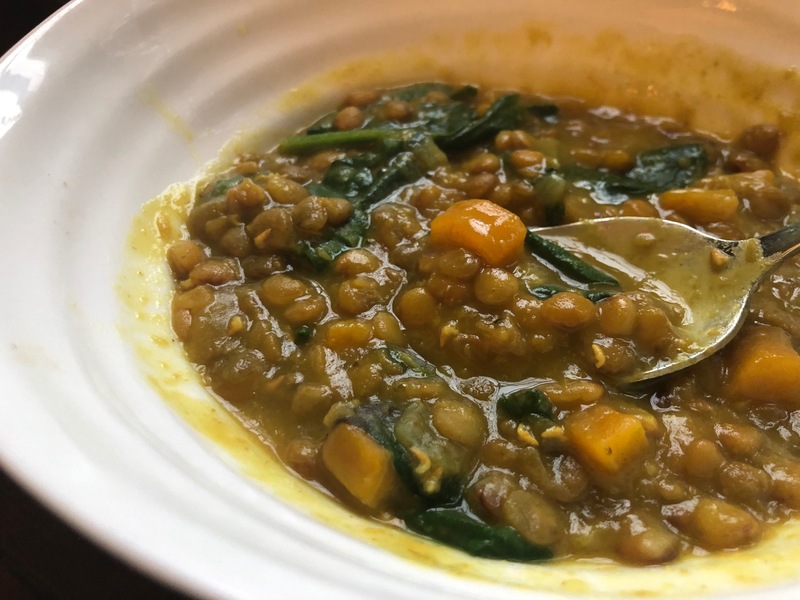 So here we are on the first day of January and I’m trying to stick with my resolutions: eat more veggies and write on my blog. Sure, it’s the first day of the year and pretty much everyone keeps their resolutions on the first day, but let’s just PRETEND that this is monumental for a second. Sweet Chili Cauliflower: I dipped the cauliflower in a garbanzo flour batter and baked for 30 minutes. Then I tossed them in a Ziploc bag with Thai sweet chili sauce. My plan is to combine them with farro and veggies for a quick lunch this week. Buffalo Cauliflower: I tossed the cauliflower in olive oil, Frank’s hot sauce, chili powder, garlic powder, onion powder, and pepper. Then I baked them in the oven for 30 minutes (turning once). I added them to flour tortillas and topped with shredded lettuce, cilantro, avocado, and tomatoes. You could add vegan ranch if you’d like! 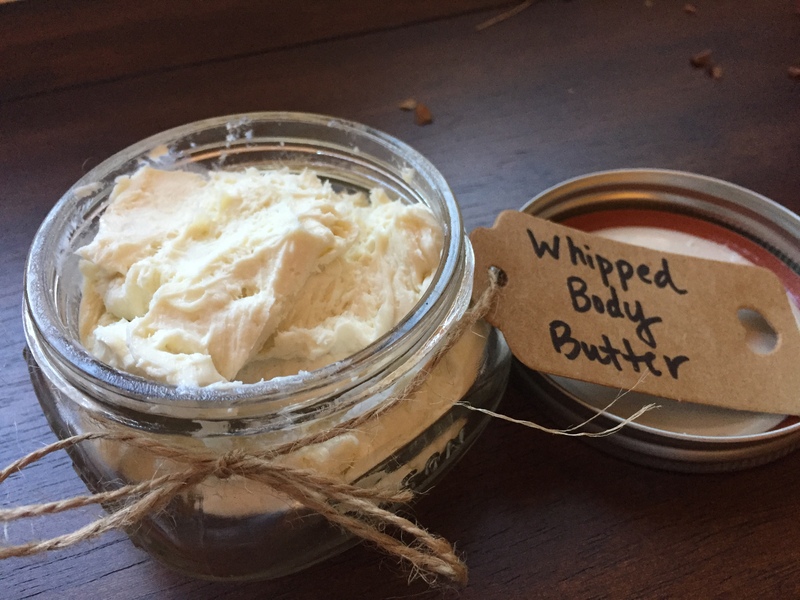 And now for what you’ve all been waiting for: Whipped Body Butter! Okay, this is time consuming but easy. Just google or search on YouTube for Whipped Body Butters and you will find a TON of ideas. 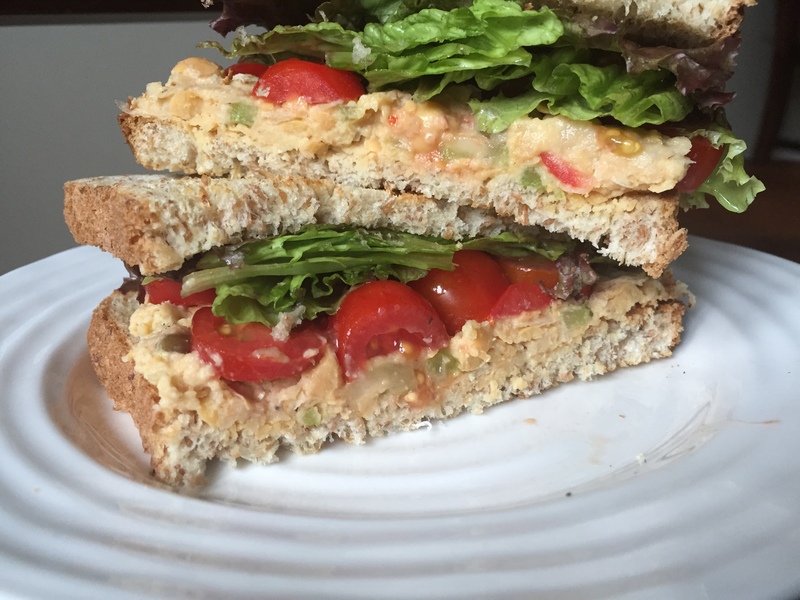 My favorite recipe can be found here. I tripled the recipe. Fill a pot with ½ cup of water and bring to a low boil. Place the shea butter and coconut oil in a glass bowl and place on the pot with the boiling water. Wait for 5 to 10 minutes until both butters are melted completely. Add your other oils except the lavender essential oil. Give the oils a minute to incorporate. Then move the bowl off of the pot. Once it cools a bit, add your essential oil. You don’t want the butter/oil mixture to be too hot or else the essential oils will evaporate! Wrap the bowl with saran wrap and place in the refrigerator (or freezer). When the mixture is semi-hard (meaning when you push your finger on the mixture, you see an indention), then you are ready to whip! Whip the mixture with your hand mixer (or your stand mixer) until your butter is light, airy, and fluffy! It should look exactly like icing. Add to jars and use immediately after your shower or bath. Enjoy! In summary, I plan to end the first day of the year eating Jones Valley Teaching Farm’s cauliflower, diffusing frankincense, lathering on my homemade body butter, and pretending that I will keep this up the rest of the year.